Come relax at Elk Ridge Cabin while enjoying an unobstructed view of Jonathan Creek Valley. Enjoy privacy and cool nights at 3400' elevation with easy access only 4 miles off I-40, and just minutes from Maggie Valley and Waynesville. Updated, modern amenities with mountain charm! Relax either indoors or outdoors while unwinding amid nature's beauty. Cozy mountain decor will make you feel right at home! Sleep like a baby in a king-size bed or wake up to the amazing valley view from the queen-size log post bed. You can choose to rock your cares away on covered or open sitting porches or relax in Adirondack chairs by the outdoor fireplace. Entertain on the multi-level decks with an outdoor gas grill and dining. Recent upgraded high-end flooring throughout adds to the well-maintained property. 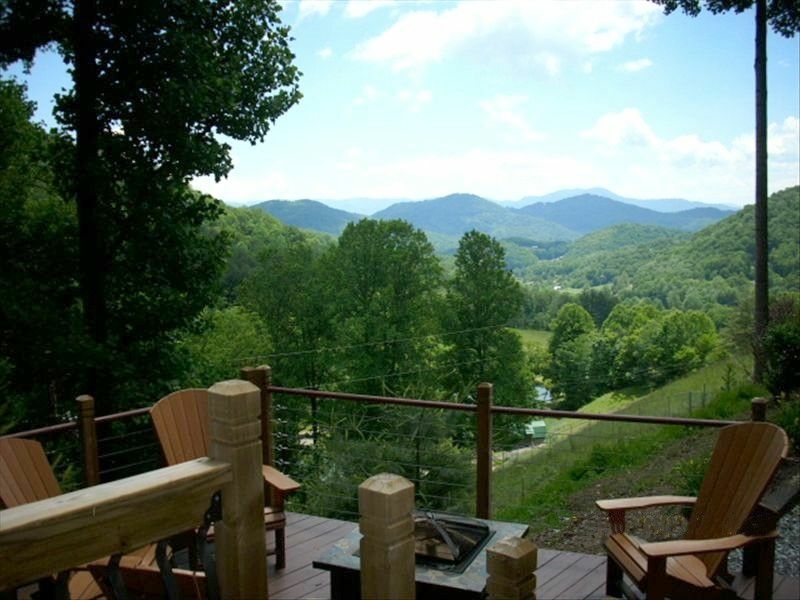 Elk Ridge Cabin is close to the Great Smoky Mountain National Park and Cataloochee Valley, and frequently Elk and other wildlife are seen grazing in the pastures. Visiting the Historic Cataloochee Valley Pioneer Settlement is just a scenic drive up the mountain, so close that you are already halfway there! Enjoy walking through the private cove past waterfalls and clear, cool mountain streams. Keep cool during the summer on even the hottest days with a multi-zone, high-efficiency A/C unit--with the availability to set each room to a desired temperature, everyone in your family will be happy! A gas-log fireplace will keep you cozy warm during Fall or Early Spring cold nights, or during a surprise snow! Come enjoy the serenity of the mountains at Elk Ridge Cabin! Dave, Debbie & Garrett. We always enjoyed coming to the mountains when we lived in Florida, needing our 'mountain fix' at least once a year. Now we live here year-round enjoying the change of seasons, unlimited outdoor activities, breathtaking nature and small-town friendliness. Maggie Valley is a great place for our family.. how about yours? unobstructed views of 5 mountain ranges, long-range valley views. Multi-zone, high-efficiency A/C & heat unit. Each room can be set at different desired temperatures & ultra-quiet! premium bed linens plus an extra set for each bed. Easy parking and turn around--no backing down a steep drive! Hi-speed internet. wireless or LAN connection provided. Plenty of towels are provided for your stay. combination Keurig and traditional brewing pot coffee maker..your choice! The kitchen is fully stocked with everything you will need to prepare snacks or full meals. Expandable table for 2 to 4, with additional seating for 3 at the bar. Bluetooth portable speaker to connect to your favorite streaming library, plus digital clocks in each bedroom featuring charging ports and bluetooth sync. or via AUX cable . expansive decks with outdoor fireplace, multiple seating, outdoor dining, rockers and swing. We spent two weeks at this great cabin. We spent most of our time on the front porch. The cabin was clean and had everything you could need for a great vacation. Best rental property we have ever encountered!! Fantastic place! Fantastic owners! Great location! Nothing missing! Great beds, decks and porches. Our Shelties loved the sheep! Thanks Debbie and Dave! Thank you for your kind review. We are always pleased when new guests have a great experience- and we hope that they will become part of our return guest family. We strive to provide an experience that exceeds expectations & love it when we succeed! Great views of mountain range, rental is spotless, wonderful to have air conditioning, they have thought of everything one would need. Owners are wonderful, happy to accommodate any need. We highly recommend this rental!! Everything you could want for the perfect mountain get away! Debbie and Dave have created the perfect environment for guests to escape , yet be super comfortable. Very well stocked cabin with incredible views! Hosts are very gracious and helpful. We'll be back! We are always pleased when our guests are pleasantly surprised by their experience - it reinforces our pursuit of providing that extra special touch that creates wonderful memories. Thank you for your kind review and we look forward to a future visit! We are so pleased you enjoyed your stay & are already planning a return visit! Our greatest compliment is always when our 'guests' become friends and come to visit again! We are truly honored by your confidence in us and are happy you had a wonderful mountain escape! Close to Maggie Valley, Waynesville, Biltmore House, Blue Ridge Parkway, Great Smoky Mountains National Park, Cherokee, waterfalls, camping/hiking and gem mining.